Get an additional discount on all sale styles right now at U.S. BCBGMAXAZRIA stores or online. 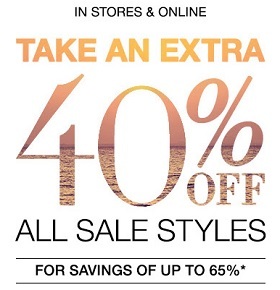 You can receive an extra 40% discount on sale styles for savings up to 65% off original retail prices. No code needed to receive the offer online or in-store. Source of the information is BCBGMAXAZRIA. The offer is valid until August 29, 2016. For more details visit BCBGMAXAZRIA stores or BCBGMAXAZRIA online.